The hour is growing late, but there is still time to make a gift for Mom. 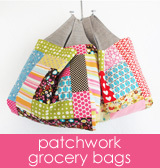 Here are three options for quick to sew gifts you can make in about an hour+/-. 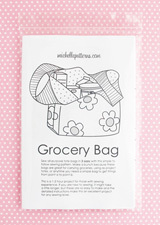 Grocery Bag - Everyone loves these bags and if you haven't already done so, make her a shopping bag or two. If you've already made her shopping bags with this pattern, you can also make a different style of tote bag by moving the handles and boxing the bottom. Below is the small bag with this mod (+ the mod for dividing the bag body) and here's a medium size bag also made with these simple changes. Bookmark - If Mom's a reader, make her a pretty bookmark. These are just lovely and make a special gift for anyone who loves a good book. Card Wallet - If you are giving her a gift card, add a personal touch by presenting it to her in a handmade pouch. 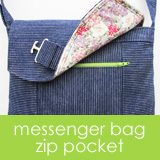 Below is Size 1 from the Card Wallets pattern.